Deciding to use vinyl siding to upgrade your home's look is a big decision, as there are substantial costs involved. Sticking to a budget will require that you research vinyl siding costs. You can find vinyl siding to suit your budget; the prices run between $4.50-$7 per square foot, depending on the style and color you choose. If you hire a contractor, your cost will increase. The accessories you choose will also influence your vinyl siding cost. Quality: Vinyl siding comes in five basic thicknesses; thicker siding will hide imperfections better, last longer, and is more expensive. The five thicknesses are: Builder Grade (.040), Thin Residential Grade (.042), Standard Residential Grade (.044), Thick Residential Grade (.046), and Super Thick Grade (.050). Also, look for The American Society of Testing and Materials certification ASTM Standard 3679, which is the minimum standard. 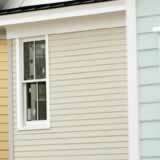 Style: You can get the traditional vinyl siding that comes in horizontal slats that mimic the look of wood. But you can also buy shaped siding, like scalloped, and horizontal siding that captures the board and batten look of wood. Use the Internet to help you decide what style and color you want. Insulation: Consider insulated vinyl siding for a more energy-efficient home. The insulation can help you save on heating and cooling bills, but will add to the price upfront. Once you decide on the type of vinyl siding you want and find some pricing estimates, start calling local vinyl siding contractors to get bids. Three to four local estimates should suffice when you want to research vinyl siding costs. Aside from your selected style and color, this is the single most important information when coming to an agreement with your siding installer.